Jon Kidwell Fitness: 4 Exercises to Start Doing Today! 4 Exercises to Start Doing Today! What is the magic number to lose weight and become fit? Unfortunately, there's not one. Healthy is a lifestyle. It needs to be incorporated into your life...every day! No one should wake up, hit the couch, watch television for hours, eat constantly, and go back to sleep. The problem is most days look just like that. We sit at a desk for hours. Drive everywhere. Find the couch as soon as we get home. We never move. An object at rest will stay at rest; an object in motion will stay in motion. ~Newton Be in motion! Fit Foundation #1- Be Physically Active Every Day! Why is it so important? Exercise and physical activity will reduce the risk of sickness and disease. Physical activity will energize your life and make you more productive. Exercise is the driving force that will help you lose weight, shed fat, and shape your body. Need a push to get in motion? You must be physically active to be healthy. Start moving- today! Four Physical Activities for Finding Fit today! 1. Hoof It- Run, walk, jog, hike, or skip. All of these activities require little more than a pair of shoes (& clothing) and a place to make it happen. Walking is an excellent start for the Chooser that is just beginning their health journey. You can hoof it in the morning, at lunch, around the office, or after dinner with the family. Wherever and however you choose to make it happen, just make it happen. 2. Spin It- Cycling is amazing exercise that is easy on the joints and like "Hoofing It" can be done almost anywhere with very little equipment. A bike, helmet, and shoes are all that are required. Tour the city, ride to work, or find a spin class. For people at any fitness level this is great because it can be as leisurely or intense as you make it. Haven't rode in awhile? Don't worry it's like riding a bike! 3. Active Adventures- Need some more excitement? Struggle with sedentary weekends? Plan active adventures like rock climbing, kayaking, walking the beach, or hiking a mountain. You get exercise, excitement, nature, and usually a story. A recent vacation I took with friends was full of active adventures. 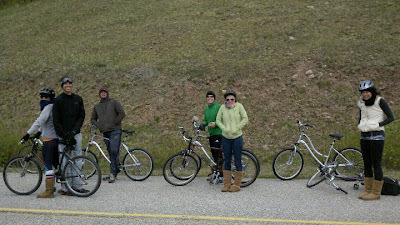 The 8 of us rode bikes down a mountain, hiked up a mountain (twice), rode four-wheelers, and walked all around town. We stayed active, felt great, enjoyed each others company, and have some great stories. We may look cold, but it was a blast! 4. Pump it up- Are you a gym rat? Do you feel as though your workouts just aren't as beneficial as they used to be? It is probably time to change your workout or your intensity. Shorten the rest time in between sets, increase your weight or reps by 10%, or add a little cardio to your pre-workout routine to get your heart rate up. For the Optimizer who truly wants to maximize their efforts I recommend Making the Cut: The 30-Day Diet and Fitness Plan for the Strongest, Sexiest You by Jillian Michaels. This book focuses on losing the final 10 pounds and getting ripped. Pumping up your workout is an excellent way to shape your body, build lean muscle mass, and speed up that metabolism. Find physical activities that you can incorporate into your life today and every day. What activities will you do to be physically active every day? Subscribe to Finding Fit or follow by e-mail. Register on the right side of the page. Do you know someone that is looking to improve their health and Find Fit? 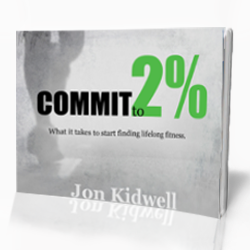 Refer them to www.jonkidwell.com or to our Facebook page atwww.facebook.com/findfit. Some of the links in this post are "affiliate links." This means is you click the link and purchase the item I will receive an affiliate commission. I only recommend products that I have used personally, believe in, and think will add value to my readers. I am disclosing this information because you deserve to know and so I comply with the FTC's guidelines. I keep physically active by little sitting and plenty of physical work through-out the day. I just finished mowing the lawn with a push mower instead of riding. Plenty of stair-stepping, etc. Continuously moving throughout the day is a great way to stay active and keep that calorie burn ticking. Great job and keep it up!